How to view active support cases for your site using the Dashboard in Connect. Cases tab on the Dashboard shows all the issues that are currently open with essensys. By clicking on a case you will be taken to the Support section of Connect for more details. 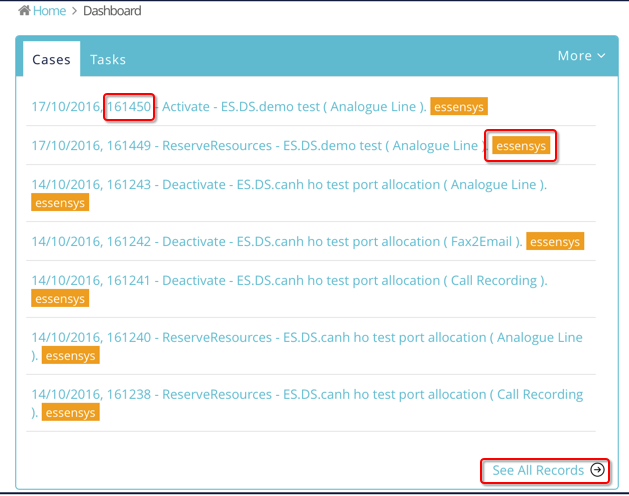 Click here to read more about Support and raising problem cases or questions with essensys. On this screen you will see case date and number, and a coloured tag showing who owns the case. 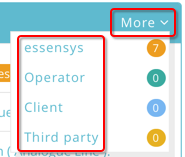 Clicking the More button will allow you to see only cases belonging to: essensys, Operator, Client or a Third Party. Each has its own coloured tag. There is a link to See All Records at the bottom of the page, this will again take you to the Support page.